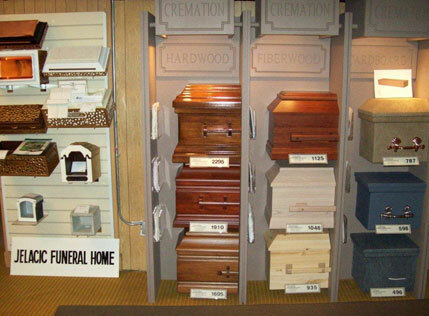 We offer a large array of caskets, burial vaults, urns, and cemetery markers. These prices are from our General Price List dated January 7, 2015 and are subject to change without notice. The least expensive casket we offer is a cloth covered octagon-shaped wood casket at $735. The least expensive metal casket we offer is a 20 gauge steel casket at $925.00 in a variety of colors. Many other caskets are offered. Please call for more information. Cemeteries require an interment receptacle for earth burials. Most cemeteries require only a concrete grave liner, which does not seal, but meets their needs by preventing the grave from sinking. This item can be purchased for $795.00 through Jelacic Funeral Home. Other containers that we offer are vaults. The difference is that these containers offer some protection to the casket by sealing. The least expensive vault has asphalt coating inside and out with a polypropylene seal. We offer this container at $995.00. The least expensive vault that is warrantied to be hermetically sealed is $1,195.00. These prices are for the Greater Milwaukee area. Outside this area, prices may differ. We offer a large variety of urns in different sizes and different materials. They range in price from $29.00 and up. We also offer you the option of purchasing the marker or monument for your loved one's grave at very competitive prices. Note: All funeral Homes do not have the same fees or provide the same care. Note: Any prearranged service at another funeral home can be changed to Jelacic Funeral Home, if you so desire. Please call Jelacic Funeral Home (414-466-2134) if you would like any further information or have any further questions. We will take the time to answer and explain all your available options. We are here to help you.